Hello beloved blog readers. As I was writing this, it was four thirty in the afternoon, and I was groggily waiting for dinnertime to start at the ninth station of mount Fuji. My head was throbbing dully from mild altitude sickness. A mouthwatering fragrance of frying onions fill the air, and if I looked directly behind out the front door of the quaint mountain cottage, there is a sweeping vista that extends over the entire Izu Penninsula and the surrounding Pacific ocean. If you shield your eyes and squint a bit, a hazy view of Yokohama... and could it be? Perhaps as far as Tokyo? This is only part of the total amount of necessary luggage required to get to the top of mount Fuji. Are you ready for a long list? Lots of snacks. Mine included bananas i brought along because they were just about to go bad, which along the road to the summit, slowly transformed themselves into banana slugs. Which I forced myself to eat as there are no places to throw away trash on the mountain. Eew. A big backpack to carry all of your goodies. Oh, and of course lots of money to pay for the crazy mountain prices! Example of crazy mountain prices: use of toilet. 200 yen per time. Mountain hut 'room' rental: 8000 per person. ... but I digress. The other hikers in my group were taking an early nap, which is necessary because we would be making the final climb to the summit at two AM to watch the sunrise from the top. Why is this necessary? Because! That is what is DONE. this is japan, there are rules here! if you climb mt Fuji, you haven't done it properly if you don't watch the sunrise at the top. Preferably while wearing, holding and packing as many North Face goods as is humanly possible to fit on your body. Even though it was four thirty PM, they were also sleeping now because we got up at four am that morning to make it to the special Mt Fuji fifth step bus by nine am, and then took a five hour hike to our mountain cottage. So needless to say, even though we took lots of breaks, including an hour nap on the mountainside around the 7.5th step and got rather odd triangles of sunburn where we failed to carefully cover up, we arrived at two in the afternoon, incredibly tired and with nothing to do. We could have probably made the whole trip up and down in one day. But I'm glad we didn't try, because after the mountainside nap my head was really starting to hurt. I tried to sip from the oxygen can, only to find it had been left open and slowly leaking my precious oxygen through the trip up, and was now empty. Luckily the other people in my group brought extra cans and are generous souls. Finally, at five o'clock came around, bringing with it something to do! ... namely, eating. The owners of this mountain cabin started serving up tiny rations of curry to the 90+ occupants in turn, who like us, would be making the climb the next morning. After we groggily munched it down ("that was a nice snack. where's the main course?" half-jokes takeshi) we realize the temperature (which was in the high seventies out in the sunshine) had dropped sharply inside the cabin in the last thirty minutes. I could even see my breath. The other hikers shivered, and were about to head back up to bed. Well, that's not happening on my watch, I thought, and snagged Takeshi's sleeve and dragged him outside. I was not sleepy at all and wanted some company. The idea was to watch the sunset. It was still full afternoon and bright, but the sun has continued its western course on the other side of the mountain, and before our eyes the shadow of mount Fuji started building up mass. Soon an enormous triangle crept along the eastern shoreline, enveloping the woods, the cities, and finally stretched over the ocean to the distant horizon, boldly shadowing even the clouds that dared get in its way. This was the famous 'kagefuji', or shadow of Mt Fuji. Finally it started to get dark, and the temperature dropped to near freezing, and I was left to watch the sunset alone as the sleepy spoilsports evacuated back to the warm comforts of the hamster-like tiny wooden room where the five of us were allocated sleeping space. This turned out to be their loss, as shortly after the 'un gai' (sea of clouds) floated in and covered the forests and town, with the remainder of the sun turning the clouds luminescent colors. I felt as if I were adrift on a solitary island on a sea of pink, purple and peach colored waves, and the bright stars of the milky way fading in one by one, as if shy. Sorry, but my camera is apparently not fond of the cold and lied to me at night saying it was out of batteries, so I have no proof of this sublime occurrence. I guess it will be only for me to remember. Finally I gave up fighting the cold and tiptoed past the snoring hamsters... i mean hikers, and turned in for the night. We awoke around 1:30 to the noise of the cafeteria workers downstairs shouting breakfast orders. actually, shouting for people to get out of the chairs and make room for the next wave of people getting their breakfasts. since the sunrise was at 4:40 and the climb to the top was only supposed to take 65 minutes from our hut, we had been planning to leave around 3, but sleeping further was proving to be impossible, so we gave up any plans of further sleep and packed up our gear. Miraculously my headaches from the altitude sickness were completely gone ...I was finally acclimatized. Well, we were currently at 3,200 meters above sea-level. It turned out to be a good thing we got an early start, because the line to the top was just that. A line. In fact, it was a Disneyland major attraction type of line, meaning you sort of jostle and move maybe one foot every ten seconds. Normally I hate lines, but Disneyland line was about the maximum speed I could handle with the steep path littered with volcanic boulders in the dark. Also I soon realized the lack of oxygen in the air was not to be trifled with. So slowly trudging along the path to the top, we were in good spirits. It had an almost festival feeling. As 4 am got closer, the eastern sky got brighter and brighter, causing looks of worry to pass on the faces close to us. Would we make it? We huddled into our down jackets and fleece and trudged as fast as we could. The sky was now a grey blue, and streaks of gold painted the vapor trail clouds overhead. 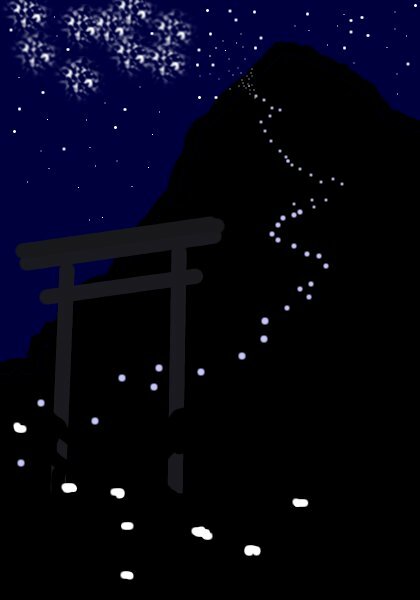 a few more exhausting feet of near vertical ascent, and we passed through the wooden torii gate marking the top of the mountain! Takeshi taught me the trick of warming the camera battery and I was able to coax it back to life long enough to get a shot or two at the top! We had a tight schedule going down, but we managed to check out the crater at the top, and the post office. Yes, there is a post office at the top of mount Fuji! go figure. Wow...I'm very impressed. Awesome job! The tiny can of O2 was ... not scary exactly, but kinda daunting. How many of those does one have to carry? Eeee o.o YOU DID IT!!! Haha, that is 'edible' O2, some kind of supplement that's supposed to make it easier for you to get oxygen from the air? or something? ... we also had a bunch of normal cans, too. What an awesome trip! Jen and I are really jealous (though not of the prices!) =). Great photos and writing too!